One doesn’t go far in Detroit’s art scene without hearing Robert Sestok’s name. One doesn’t go far in Detroit without seeing his work. Sestok’s singular (and Detroit borne) metal sculptures dot the city in various stages of rust, which he oils every couple of years to keep them from rusting too quickly. He’s been erecting them across the Detroit since 1980, and in the summer of 2015 he revealed a large quantity of them in a formerly vacant lot on Alexandrine near the Lodge Service Drive. A simple stroll through the Sestok art park, aptly named City Sculpture, reveals a thirty-five year history of Detroit’s scrap metal re-articulated into towering sculpture indicative of Sestok’s angular, jutting, rusted and occasionally muted sense of metal. The lot is a must see for anyone visiting Detroit for public art. Along my journey of interviews for Live in Woodbridge and Art in Woodbridge, Robert’s name came up dozens of times. 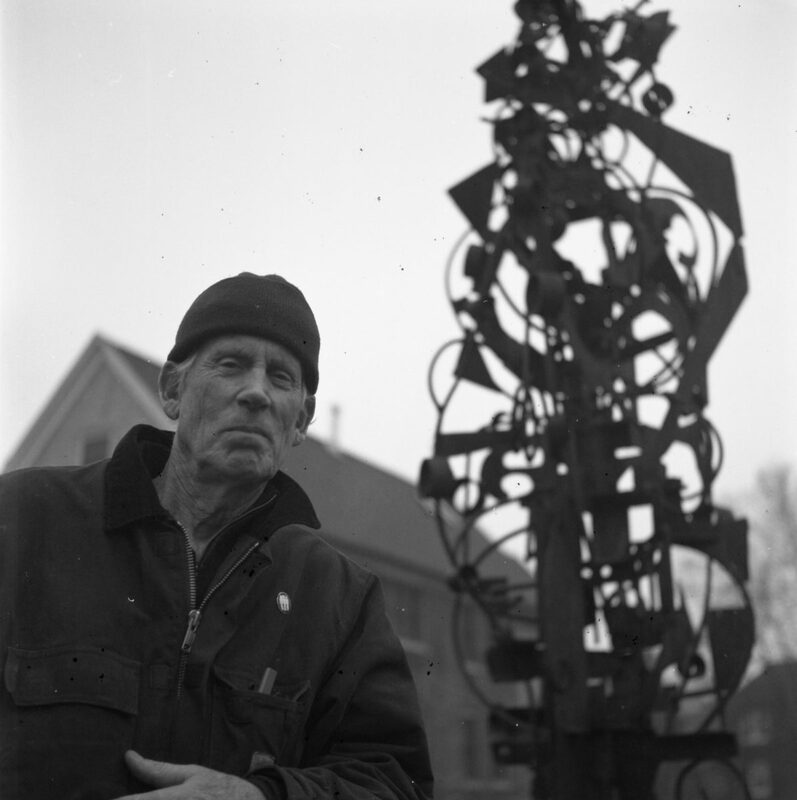 Artists mention him as prolific in the community; workers who see his work around town, and general admirers alike speak of him with a sense of reverence. If there are any living legends in Detroit’s art scene, Robert Sestok is one of them. We stood near his Woodbridge installation, titled “Nicole’s Garden” which was erected on Putnam, near Commonwealth in 2014. TL: Born and raised here? RS: Yeah, I was born in 1946 at Harper Hospital right in Midtown. In 1967 I moved back to Detroit. I lived out in Birmingham a while. TL: Are you formally educated, or did your sense of craft come about from other means? RS: I studied at the Detroit Society of Arts and Crafts, which is now College for Creative Studies. I graduated from there in 1969. The Yamasaki building was their main building, and they had some homes on the street. Today, the street is gone, they built a new building, tore down all the homes — it’s totally changed from what it was when I went there. TL: What sort of degree did you take? RS: I got a degree in fine art. My major was in ceramics. RS: I started seriously welding about 1980. Before then I did mixed media, painting and murals. It came out of the mixed media work I did using scrap lumber. I always knew how to weld. It wasn’t until I built my studio that I started to seriously weld, around 1985. TL: Some folks go about their craft with the mindset, And now I’m going to say something, or ask a question. Some folks don’t and just start working. Is that how it is for you? RS: Yeah, pretty much. I work in a free-form kind of idea. Things evolve naturally and you just go with the flow. TL: So it’s more of an expression than trying to make a statement? RS: Well, I would love to do a lot of large-scale work, but you know, it’s out of my budget. So I work within a budget — what I can afford to do, which is kind of a shame. I think that the older I get, the bigger the pieces get. TL: Why do you think that’s happening? RS: I think that has something to do with commitment. I’m really committed to making my ideas into a reality on a large scale. It doesn’t happen overnight. You have to have an idea of what you want to do and how you want to do it. Over and over in my mind the ideas develop and grow. I plan things out — they happen. TL: Your work reflects Detroit in a lot of ways. Is that a byproduct of your work being scrap metal from the city? RS: I think artists are influenced by their environment. People paint interiors, their work spaces, outside of their spaces. They look to doing self-portraits. I think that plays a really big part in artists’ lives. If you’re an abstract artist, you tend to go with your feelings. I tend to go both ways with my work. I always try to come up with something new. TL: So, the majority of this is scrap? RS: Yeah, I get my metal from scrap yards, people give me metal, I find metal. But, things are starting to slim down. In the old days, people would just throw stuff out. Actually, the price of metal is really low right now, but it does have a value to it. It’s like grey gold. TL: You coat these pieces with oil? RS: I try to keep them coated but it doesn’t last. This piece here in the garden, it needs some oil. Every couple of years I oil ’em up. It makes them last longer. When I’m gone, I don’t know what will happen. TL: The work in the park, are those primarily from other parts of town? How did those come together? RS: I’ve got work all over town. Some of the pieces in the park, I’ve put them in shows, driven them to New York and throughout Southeast Michigan. I’ve been in community sculpture shows. Having the park is nice because it’s a way to showcase the work and not have to haul it all over town. TL: Things are happening rapidly in Detroit. If you could have something, if anything, for artists in Detroit as things continue to change, what would that be? RS: A lot of my friends that I went to school with became teachers, some of them moved to New York and they wanted to be in the New York art scene. I stayed here. I go to New York and visit people, and I thought I’d live in New York, but I’m hooked on Detroit. I rehabbed my own house. I raised my daughter and I did carpentry as a vocation, and I made art whenever I could, which was pretty much on a daily basis. You know, you have four hours a day to work. After pounding nails all day and cutting wood, I’d come home and build a fire in the wood stove in the studio and weld stuff together or paint paintings, and, you know, just be creative. At this point in my life I’m a full time artist. TL: How have you seen the creative process change for people who devoted themselves to teaching? What does that do to an artist? RS: Well, I don’t know because I don’t have that experience. I mentor a lot of people, which is kind of teaching. If someone wants to learn how to weld, I’ll work with them for three hours and show them how to weld something. It’s like sewing, it’s really simple. But, people who teach for a living, and they do it over and over, and get paid for it — it becomes a drain on you. But, you know, you have to keep moving forward. You teach painting, and then you go home and you make paintings. The nice thing about teaching is that it’s not heavy work. You’re not destroying your body by lifting bags of cement. I don’t think it matters at all what you do, as long as you stay focused on your art. Some people get a little lazy. TL: As there’s less and less space available in the city, what should Detroit artists try and procure while they still have the time? RS: There’s a lot of different factions within the city of Detroit for artists living and working in various communities. Midtown is getting built out but the surrounding areas are not — Detroit is a big city. If I was a young guy today, working on stuff, I wouldn’t try and fit into a neighborhood like Midtown. I would be getting some place that’s a shack and living in that kind of a situation. You can buy a house for $500, jeez. It’s probably habitable, but that’s a good deal. I did that. I bought my house for $2000 in 1982 and fixed it up. It didn’t have doors or windows and the back wall had fallen down. I just bought a house for $500. I’m tired of all the traffic in Midtown, so, I’m moving to the country. Only five miles from Midtown, east of the cultural center on Farnsworth, near the Packard Plant. It’s a community that’s on its way up and getting built. There’s homes and vacant lots. I mean, not everybody has the skill and ability to rehab their own property. So, you have to make money to pay your rent, or you make money, buy a cheap place and make money to fix it up. TL: There’s mixed emotions on all the folks coming to Detroit and claiming a part of it, kind of butting up against the folks who have already been here. Cheap rent, a place to do craft, etc. How do you feel about that? RS: I’m amazed at the amount of artists there are today. When I started out back in 1967, it was literally a couple of handfuls of artists in the Cass Corridor. Most people lived out in the suburbs. As the auto companies shut down and people left the city, and after the Vietnam War, more people started to move in and look for good deals, and the city kind of got built back up. Gentrification happens. it’s a natural process. Things fall apart and they get put back together. That’s our instinct. We’re kind of like ants — fixing a hole, building things, repairing things.